Think about it. If you work a 40 hour a week job, the majority of your life and time is spent with the people that you are around in the workplace. We have changed the standard of work life and work colleagues to be our real life sisters, moms, best friends, neighbors. Every single month we run mentorships, masterminds, biz chat threads to support you as you hit the ground running. We want to get you plugged in!! I want you to consider a few things....the business for you could be casually sharing with a few friends here or there and getting $50 per referral. OR you might think I need a change. You may have dreams stuffed down so so deep that you don't even know what they are anymore. We talk about it as becoming a product of the product. The more products you invest into, the more you can talk about what you LOVE which in turn will end up in you sharing about your new found love for XYZ which will in turn end in friends wanting what you have. a product of the product. Investing in products = testimonies = sharing YL with friends = friends signing up = more health change. You end up being able to help more people that more you know about how to use oils and products. You might be wondering just IF this oil business can be a professional paycheck for us. 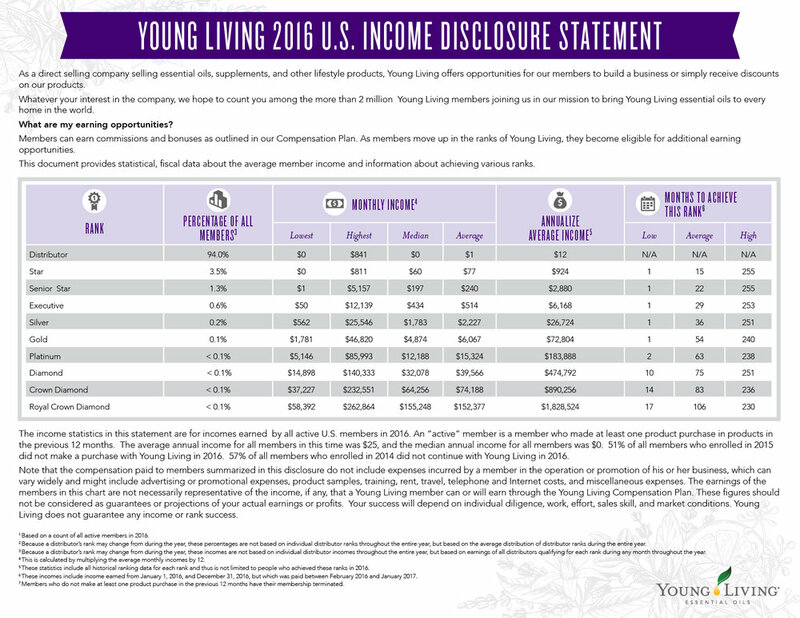 Take a look below at the Young Living income disclosure to see average paycheck numbers at the different ranks of YL. With a whatever it takes mindset this is possible!! The only way to fail is giving up! The average 60-year old has less than $104k in the bank, now if they were earning 6%(high) back, they’d be making $520 per month. STAR, making an average of $77/mo, it would be the same as having $15.4k in the bank and living off the interest. GOLD = $6,067/mo you’ve essentially hit the lottery, because it is like having $1.2M in the bank.